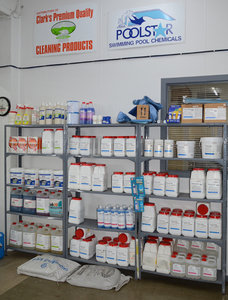 We stock Poolstar and Clark chemicals for regular routine pool treatment for your pool. Testing your water is a crucial part of pool care and recommend that we test your water monthly. When your pool water is balanced, it is easier for you to look after, will be nicer, safer and healthier for you to swim in and your swimming pool or spa pool and equipment will last a lot longer! Bring your sample bottle into us and we will carry out various tests on your water and can step by step show you how to correct levels. We have a great range of traditional Clark Cleaning Products.